Centrifugal pumps are silent running, simple to service and operate, and can handle small solids without pump damage. They provide high GPM flow but relatively low pressure. Years of trouble-free service can be expected without servicing filters or check valves. Centrifugals will not self-prime; a flooded inlet is required. 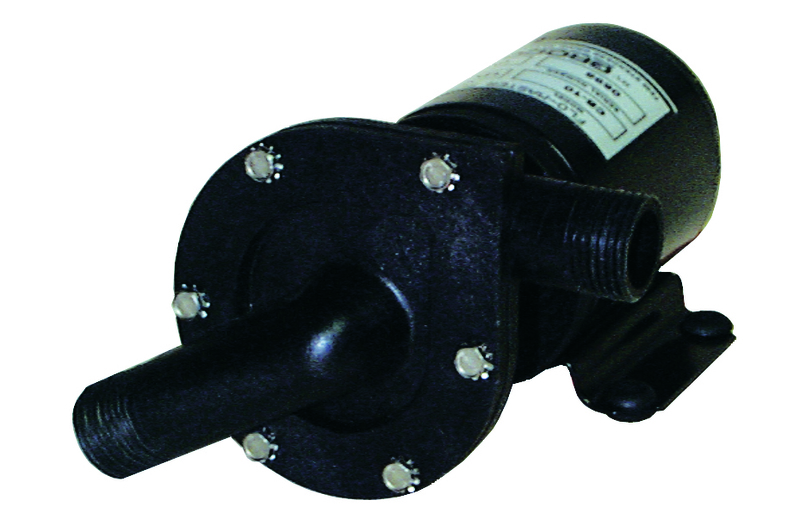 Combines CP-20 performance with a light weight non-metallic pump. Inlet and outlet are threaded for garden hose or for 1" ID hose. Continuous-duty "Ignition Protection" motor with #316 SS shaft. 17 GPM flow is ideal for baitwell circulation or any onboard pumping job that needs high GPM flow but relatively low pressure.